This January, as part of leveling up my healthy habits, I started subscribing to Prep Dish. Since I’ve been in grad school I have found that getting well-rounded meals to the table reliably has become much harder, especially during finals! Prep Dish offers paleo and gluten-free, dairy-optional menu plans that are heavy in veg and family-friendly. 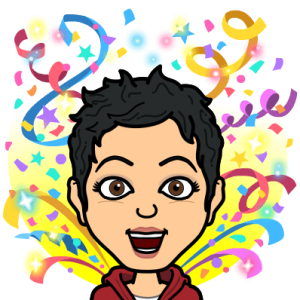 Since starting, I’ve been able to become a food prep pro and have taken a huge mental load off of choosing new recipes and figuring out my grocery list. Allison has masterfully assembled the menu for the week, organized the shopping list for me, and given clear, concise instructions to batch prep 4 dinners, a salad, snack, breakfast, and dessert for the week in just one afternoon. With practice I’ve been able to reduce my weekend prep time and have either heat and eat meals or meals which take about 30 min to cook all prepped and ready to go. Each menu serves a family of 4, so our family of 2.5 has leftovers for lunch that keep us through the entire week as well, so this really takes a lot of meal planning logistics off the table for me. When you eat vegetables in the morning, I feel like celebrating! Some of my favorite recipes I’ve tried this year are the Lamb Kofka w/ Tahini Sauce, Paleo Snickerdoodles, Cider Cream Scallops over Mashed Cauliflower (which I’ve made multiple times), Chicken w/ Peanut Dipping Sauce, Sesame Broccoli & Brown Rice, Paprika Roasted Chicken w/ Trio of Roasted Vegetables, Apricot-Glazed Chicken Thighs w/ Broccoli & Sweet Potatoes and lots more. Nearly every week has at least one “home run” recipe that I can add to my repertoire of tried and true favorites. Each Friday I get my instructions emailed to me, so I can do my shopping that night after work or on Saturday for Sunday prep. This week’s breakfast is a Mediterranean Frittata that is so loaded with veg that each slice has 1.5 servings of vegetables. This makes me SO HAPPY, because getting veggies in the morning is quite a challenge for lots of people. This frittata has a lot of flavor and is a filling way to get started in the morning. Make it on a Sunday and enjoy it for the next few days! Serve it for Brunch on the weekends! Special thanks to Allison Schaaf, creator of this recipe, for permission to repost it here. If you are ready to take hours of time back in your week spent planning your meals, be sure to check out Prep Dish. Dice artichoke hearts and add to diced onion and garlic in a glass bowl. Half cherry tomatoes and add to the bowl. Add 1 tsp olive oil or coconut oil in a deep skillet on medium high heat. Add onion, garlic, artichoke hearts, tomatoes, herbes de provence and salt and pepper to taste to the skillet. Sauté for 6-8 minutes, allowing the moisture to evaporate. Add spinach and olives and cook 2-3 minutes more until spinach wilts significantly. Return to the bowl to cool. Crack 8 eggs into a large bowl and whisk until well mixed. Stir in cooled vegetables, adding 4 oz feta if desired. Place into an oiled 9″ by 9″ dish or pie pan and bake at 350 degrees for 40-45 minutes or until center is firm. This recipe is a simple derivation from the recipe used in the movie Chef, which was a hit amongst foodies in 2014. The original recipe can be found here. 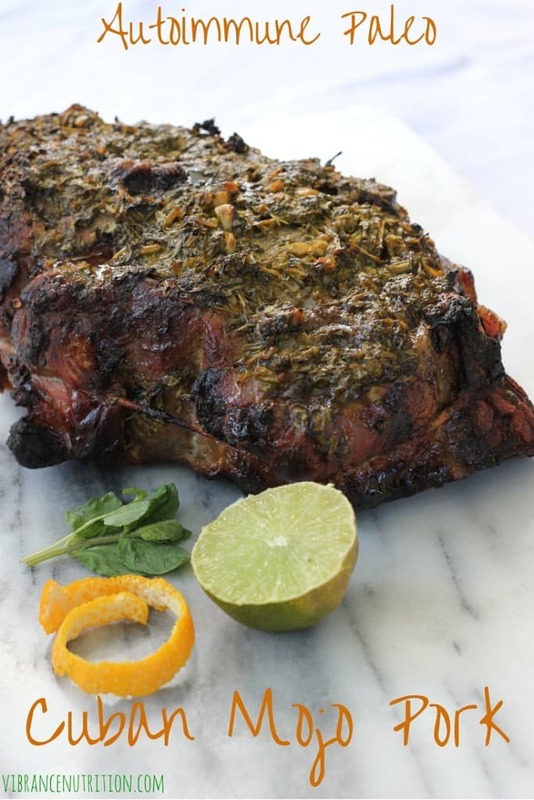 This pork roast is an easy and highly flavorful dish that is most authentically served alongside fried plantains or sliced, tucked into a homemade plantain wrap and served with a salad. Simple and Merry makes my favorite plantain wraps recipe, which you can find here. As I am testing out the AIP diet on myself I am eager to find easy dinners and meals that can be prepared with a wide variety of flavor. It’s very easy to get bored on AIP, so we gotta shake it up as much as we can! Try this out and tell me know what you think! Place all ingredients aside from the salt and pork in a blender and food processor and pulse on low to finely chop the herbs and garlic. Add a tsp. of salt to the marinade and pulse again once to mix. Set the pork in a large glass bowl or baking dish and cover with marinade. Cover and refrigerate overnight, rotating once to allow both sides to soak up the marinade. 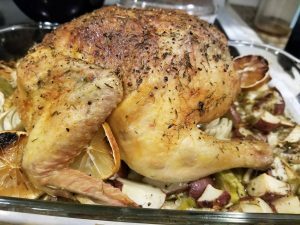 Preheat the oven to 425° and set a rack over a shallow roasting pan. Transfer the pork to a cutting board and discard the marinade. Fold the pork under itself, into thirds if necessary, and tie with string to form a neat roll. Season all over with salt and place it upon the rack. Remove the pork form the oven and to a carving board and let rest for 30 minutes. Remove the butcher’s string, slice across the grain and serve. Place all ingredients aside from the salt and pork in a blender and food processor and pulse on low to finely chop the herbs and garlic. Add a tsp. of salt to the marinade and pulse again once to mix. Place the pork and the marinade in an extra large ziploc bag or double layered plastic bag and use a rubber band AND butchers string to tie it together. Freeze for up to 3 months. To cook, remove from freezer and thaw overnight. Preheat the oven to 425° and set a rack over a shallow roasting pan. Transfer the pork to a cutting board and discard the marinade. Fold the pork under itself, into thirds if necessary, and use the butcher’s string from the freezer bag to form a neat roll and tie it together. Season all over with salt and place it upon the rack. This looks oh-so naughty but is quite fat-loss friendly! The listed serving is 4 oz. 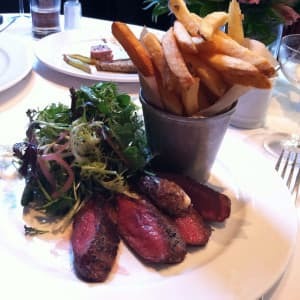 of steak and 1/4 of the fries, but few people I know will be satisfied with such a small potion. In mi casa I double the meat and add a salad to balance the meal. Consider this to serve 2-4 people. Toss potatoes in oil and add rosemary and 1/2 tsp. sea salt. Layer on a baking dish so they do not touch (this is essential to crispy oven-baked frites!). Bake 20-22 minutes or until golden, tossing halfway through baking process. Remove from oven, gently loosen with a spatula and keep warm. While potatoes are baking, whisk vinegar, mustard, pepper, thyme and remaining 1/4 tsp. salt in a large dish. Add steak and marinate for 20 minutes, turning occasionally. Place oven rack at highest position and switch oven to broil. Oil a broiler pan. Broil steak for 6-7 minutes per side or until desired degree of doneness is achieved. Remove and let rest for 5 minutes. Cut into 2-4 portions, depending on appetite. Place steak and 1/4 of the frites on each plate. Garnish with parsley and serve with extra mustard, if desired. To prep ribs:Preheat your broiler with the rack 6 inches from the heat source. Season the ribs liberally with salt and pepper and lay the ribs, bone-side up on a foil-lined baking sheet. Broil the ribs for 10 minutes, flipping them over to broil on the other side after 5 minutes. Stack the ribs in a single layer in the slow cooker. Toss the pear, coconut aminos, garlic, scallions, ginger, fish sauce, and vinegar in a blender. Puree until smooth. Pour the sauce evenly over the ribs then add the chicken broth. Cover with the lid, set the slow cooker on low, and let the ribs stew for 9-11 hours. When ready to serve, remove the meat and set aside. Let the remaining sauce sit for five minutes, then skim fat, if desired. Ladle some of the sauce (about a cup) over the ribs and serve with diced fresh cilantro. Serve the remaining sauce on the side or save it as a marinade for chicken, pork or beef. 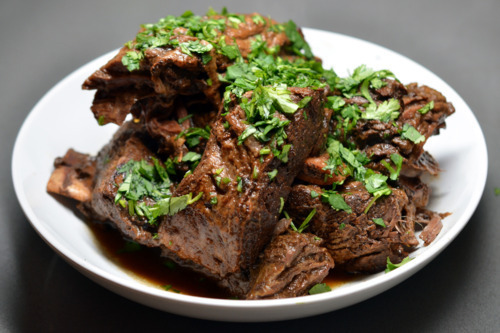 This recipe has been adapted from one published by the New York Times. It’s a great way to branch out and try Delicata – a squash in season that is frequently overlooked due to pumpkin madness and our familiarity with other squashes such as acorn and spaghetti squash. I had a turtle that loved Delicata Squash, so I always think of this winter vegetable fondly. I find the incorporation of the squash into a full meal to be perfect for the colder, darker days we face. Using chicken thighs instead of breasts adds a bit more richness to the dish and also increases satiation when winter cravings show themselves. 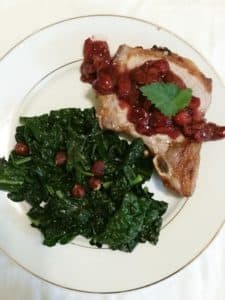 Serve with sautéed winter greens drizzled with balsamic vinegar and studded with dried cranberries. 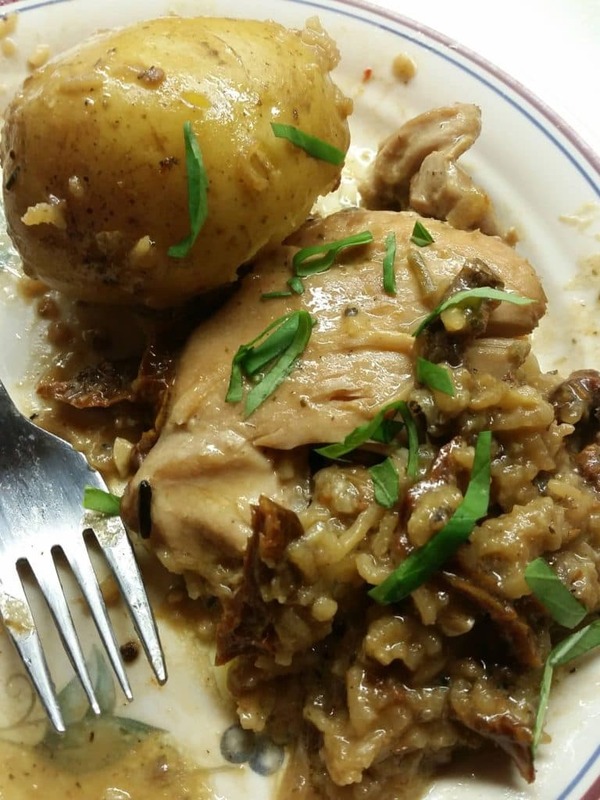 Try this recipe tonight and tell me what you think! 1 delicata squash (1 and 1/4 pounds), sliced into 1/4-inch-thick rings, then seeds removed. 2.In a large bowl, toss chicken with lemon slices, 1/2 tablespoon oil, 1 teaspoon salt and pepper. Rub sage and coriander between your fingers or palms and mix well into chicken marinade. Let stand 30 minutes. 3.Heat oven to 425 degrees. 4.In a small saucepan over medium heat, combine syrup, butter/coconut oil, remaining 1/2 teaspoon salt and chile powder. Simmer on low for 3 minutes. Remove from heat and toss with squash. 5. Spread squash in a 9-by-13-inch pan or on a large rimmed baking sheet. Nestle chicken and lemon on top of squash. Roast for 15 minutes. In a small bowl, toss scallions and remaining oil. Scatter over chicken and squash; keep roasting until chicken is no longer pink, about 20 minutes more. 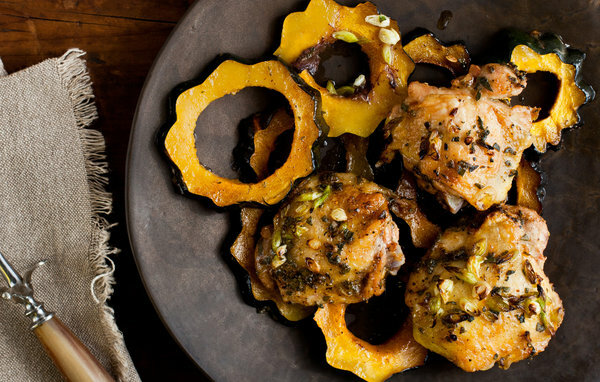 If you have had delicata squash before – what is YOUR favorite way to eat it? Comment below and share your ideas and tips with us! I nabbed this recipe from paleo Betty – it’s great for a hot summer day or a refreshing lunch al fresco! Bring a pot of water to boil and cook shrimp for about 3 minutes, until just cooked (they’ll be pink). Drain, cool, de-tail, and roughly chop shrimp. Squeeze limes into a medium bowl. 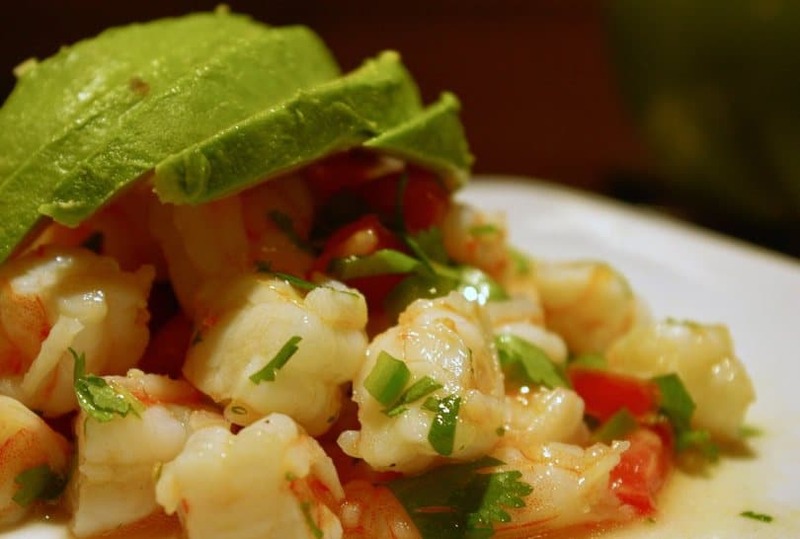 Add shrimp, shallot, tomato, jalapeno, olive oil, salt, and pepper to lime juice and combine well. Cover and let marinate in fridge for a minimum of one hour. (can chill up to six). Stir cilantro into chilled mixture. Serve ceviche with a slotted spoon and top with 1/4 sliced avocado.